Buy for yourself or treat a friend, and support missions today. Why Haven’t They heard of Jesus? For many reasons millions of people remain unaware of the love and goodness of God in Christ. For many it’s simply because they live beyond the reach of an indigenous Christian community with adequate numbers and resources to reach out to them. It’s also because many church missions are focused on their local communities, and so the distant and the hidden people will only be reached by strategic and intentional efforts, like FEBC. However, the Good News of life in Christ is being believed and enjoyed by more and more people all the time. But we have quite a way to go. Evangelism and discipleship by media is reaching millions of people, and is a vital complement to the face to face work of the church. It has always been God’s way to initiate friendship and draw people into right relationship with Himself. The Bible begins with humankind in a beautiful relationship with our Creator and Father God. It ends with that relationship profoundly restored after a tumultuous break due to human sin and rebellion. God is now our Father and Saviour, our Redeemer, our Healer, our King. In this present time between Jesus’ resurrection and His reappearance we have the amazing privilege of communicating God’s saving grace to all people everywhere. By words and actions, empowered by God the Holy Spirit. Thanks to people like you, by prayer and technology we are reaching out to people wherever they are, and millions are responding! HOW? On air, online, and on the ground. In all the countries where we work the majority population are not Christian. In many places Christians are marginalised or even persecuted, but our goal is to communicate faith, hope, and love in Christ to everyone, so our content is a careful blend of both evangelism and discipleship. We currently broadcast in 100 languages, from 148 stations and partners, and growing. Radio is an amazing communicator, as are the numerous digital media available via the internet – able to reach deep into countries, across borders, and deliver powerful messages into the minds and hearts of listeners wherever they are! We utilize high powered AM, FM and shortwave transmitters to deliver community development, evangelistic, and discipleship programming to some of the most remote and needy areas of the world, as well as cities and dense population centers everywhere. As new technologies emerge that show promise at reaching specific people groups or large numbers of people, we adapt our strategies and adopt the media.This includes media streaming over the internet, satellite broadcasting, mobile Apps, podcasting, MP3, cell phones/memory cards/ speaker boxes to reach people, especially those living in restricted countries. We developed truly mobile broadcasting equipment for rapid deployment and critical information assistance following disasters. First Response Radio or Disaster Response Radio deploys to a disaster zone within three days of a cyclone, earthquake, tsunami, or volcanic eruption. Establishing collaborative relationships with government and other aid organisations, we broadcast critical information, as well as distribute solar and wind-up radios to the survivors. What’s the plan for getting all this done? 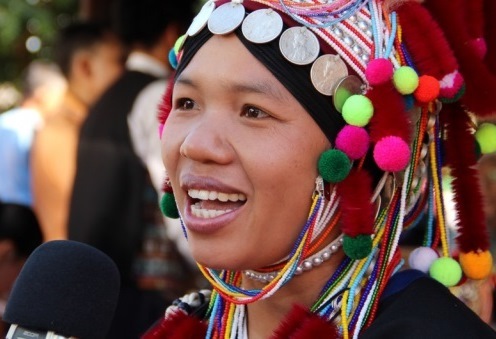 In cooperation with other like-minded ministries – FEBC partners with local believers (if there are any), or nearby churches, to develop and assist genuinely local broadcasting. FEBC International is an association of 22 autonomous national offices, so no one country owns us or “pulls the strings.” All our stations are partially self-funding, raising whatever they can locally in order to operate. This self-funding ranges from 23% to 83%. Our “resource countries” (those who supply funding and expertise) partner financially by contributing the shortfall and ensuring that general operations and special projects can continue to go to air. This is truly multi-cultural teams banding together for the sake of the name of Christ. FEBC member stations are locally owned and operated. The local board and Executive Director or Station Manager are nationals of that country. What binds us together internationally is our commitment to Christ, and His call to make disciples and build His Church. We are committed to a shared mission, and signatories together of a Charter of Association. FEBC stations collaborate regularly with other Christian ministries, local and national government bodies, and any organisations that will enhance the wellbeing of people and help the communication of God’s grace. 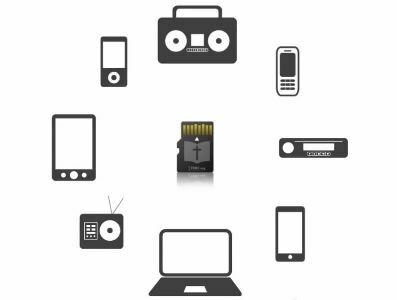 Radios are regularly distributed among communities, prisoners, remote villages, and towns, and in disaster prone regions. 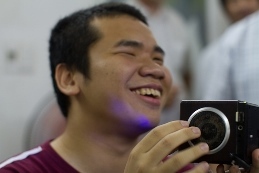 Contrary to popular belief – radio is still the most accessible mass media in the world. For more than half the earth’s population the internet is still inaccessible! So Christian ministries that work to reach people and communicate life-giving programmes must use all the methods available, new and old. The vast majority of our programmes are produced where they’re broadcast. Local people aware of local issues, offering Biblical perspectives in relevant ways. The life of God is promoted in developmental programmes discussing subjects like family life & relationships, work skills and business development, HIV/Aids, pregnancy issues, joblessness, poverty & financial wisdom, agricultural advice, and many others; and, emergency first response radio stations are established in crisis zones to provide help in times of disaster like cyclones, tsunamis, earthquakes, famine, displacement and volcanic eruption. Since the mid 1940s FEBC has been passionate about telling all people everywhere that Jesus Christ is Lord and God, He is good and wise, caring and powerful, and that following Him is the way to live life. Through all sorts of programmes and on-air content we’re meeting people at their point of need. Our programmes inform, entertain, instruct, advocate for change, inspire, witness, argue, announce and proclaim, counsel, supplement, celebrate, model and invite participation. 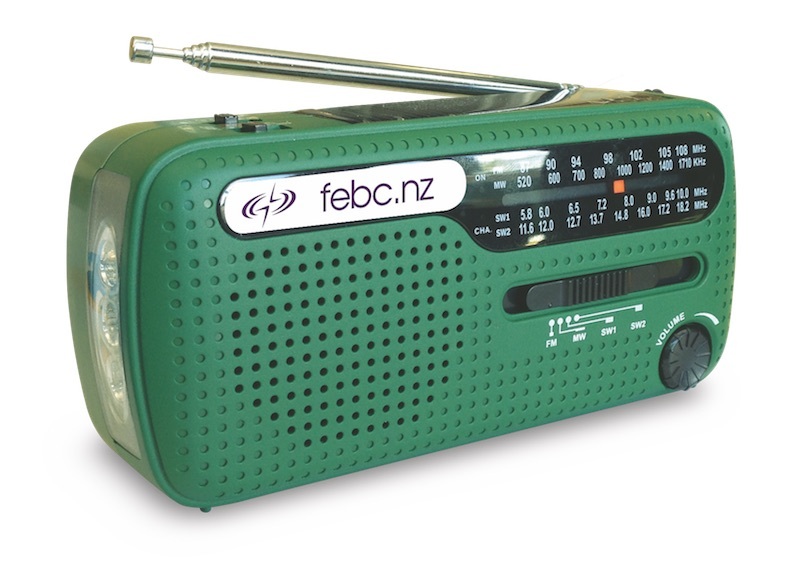 FEBC NZ is a Member of FEBC International, an association of stations and resource offices from all sorts of backgrounds. From numerous nations and many Church movements, we’re passionate about Jesus, and committed to working together to reach people wherever they listen. We’re compelled by passion for Christ and called to the great commission. We’re motivated by the great commandment (to love God, and love one another), and dependant on God to guide our steps and supply our needs. We support indigenous Christians to reach their neighbours for Christ. Our programme producers live and move among their listeners, and numerous programmes are produced where people are e.g in the streets, in coffee shops, in local events. With cultural sensitivity and intelligence, we communicate in the language and style that best addresses the issues people are facing. We partner with like-minded individuals and organizations to accomplish our common goals. We are committed to remain inter-denominational, faithfully subscribing to a common Statement of Faith that allows unity in essentials, liberty in non-essentials, and love in all. Being part of an international association, we are committed to respect the autonomy of our members, and to engender trust and cooperation as we advance the mission we share together. We are committed to do the best we can in all aspects of the ministry with effectiveness and integrity as befits the whole Body of Christ. Our FEBC International members can be found here.